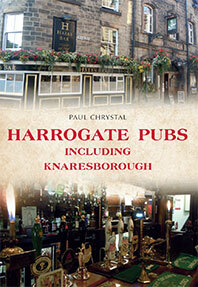 This 96-page book (100 illustrations) includes detailed comments on ‘the best of pubs‘, 15 in central Harrogate, eight in Knaresborough and another 22 in the local area. Also included are two local breweries: Daleside and Roosters. Each entry includes full address, phone number and weblink. A number of closed pubs are also listed. The introduction covers a wide range and includes a short history of the development of pubs, changes in brewing and the effect of changing modes of transport. For example, the growth of the railways and the rise of the motor-car each provided the impetus for changes in both the size, function and number, of licensed premises. These changes are in turn, linked to economic and social development. The author also clearly draws out the differences between Knaresborough, an ancient market town, and Harrogate, a Victorian newcomer who originally made its name as people visited to take the waters. There are many detailed descriptions and anecdotes, including much social history. The pub entries vary from four pages for Hales Bar to less than five lines for Charlie’s Place Pub and Bar (both in Harrogate). Many of the descriptions are very detailed, mainly concentrating on social aspects, origin and name, not pub design and architecture. There are many illustrations of varying age and a wealth of factual information. in the same year, Charles I rode past the Black Swan (Harrogate) when ‘his high crowned hat was knocked off by a low hanging branch of an ash tree.’ Apparently, the owner of the tree had it felled! This publication is the result of much extensive, often archive-based, research. A number of entries are listed buildings. It would have been useful to include the category (I, II* or II). Three clear maps indicate the geographical location of the listings. However, only one map includes the scale. Entries are not listed in alphabetical order. Hence, an index with a list of names and corresponding page numbers would be a useful inclusion. Not surprisingly, considering the number of entries, there are some errors. For example, it is stated that a name from the nineteenth century, Hull Brewery, is ‘still alive to-day.‘ Brewing at the Silvester Street site ceased in 1985. In addition, some information seems to be missing; for example, the year when the Harrogate Tap made new use of an original station building dating from 1862 (December 2013). It could also have been useful to mention the third brewery in the area, Harrogate Brewery, also founded in 2013. To summarise, this is a book for those interested in both the social and economic history of the two contrasting towns and their wider location area, and those interested in pub history. There is much to commend.